Local Sheffield resident and Penistone Footpath Runner Peter Knight is known locally for running the miles dressed as an oversized bottle of Farmers Blonde. This year he has set himself an ambitious new challenge and will be donning a new costume in the shape of a beer glass. Peter is attempting to smash the world record for the fastest glass to run 26.2miles at this year’s London Marathon on 28th April. Despite over 20 years running experience, Peter admits this latest challenge is an ambitious one and his training will need to be intense if he is to succeed in his attempt. The time for completing the marathon in this style of costume has been set at 4hrs and Peter is hopeful that he will be able to achieve a time within that. He has worked closely with costume makers Frenzy Creative to ensure that the costume meets the requirements of GWR and is as lightweight as possible in order to give him the biggest chance of success. Peter will be giving the costume a test run at the Sheffield Half Marathon on Sunday the 14th April – keep an eye out for him and give him a wave! The idea for the glass costume was centred around Peter’s favorite tipple, Farmers Blonde and his previous running adventures in the Farmers Blonde Bottle costume. Commissioned by Bradfield Brewery, the glass resembles a pint of beer and features the Brewery’s branding. 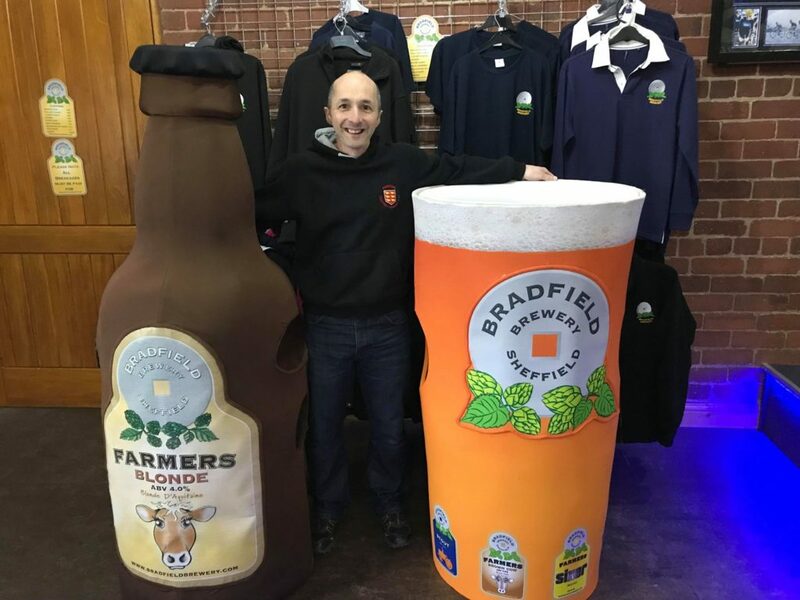 Having previously ran for the Brewery in their Blonde Bottle & Belgian Blue bottle costumes, Bradfield Brewery welcomed Peter’s idea to create a new costume for this world record attempt. Where there’s a lot of running, there is usually a good cause and this is no exception! Peter embarked on this ambitious challenge to raise funds for MYAWARE. MYAWARE is a charity that offers support to sufferers of Myasthenia, a rare condition that causes muscle weakness in a person’s voluntary muscles. These are muscles whose action is normally controlled by an individual’s will such as the arm and leg muscles. People with myasthenia have characteristically fatigable muscles and the harder people with myasthenia try, the weaker they get. The myasthenias are a group of neuromuscular conditions. They are rare but also manageable. Myasthenia can affect anyone, old or young and of any gender or nationality. A work colleague’s family has shared their experience of the struggles this condition can bring to family life with Peter and he felt compelled to offer support to the charity via his running challenge.